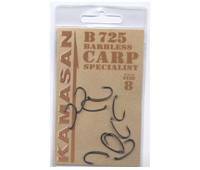 Perfect with pop-ups or bottom baits the B725 barbless has a needle sharp straight point. With its long straight shank down turned eye and special bend the design is a popular and well proven shape. Perfect for all modern anti eject rigs. 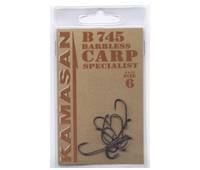 Designed to cope with the most demanding conditions, the B775 barbless is produced from extra strong, super high carbon wire. The point and bend are forged for strength whilst the swept shank and point ensures ultimate holding power.